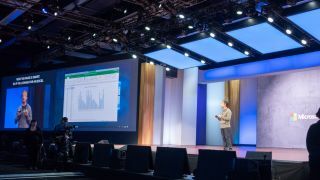 Microsoft took the time to go over Sets at its Build 2018 conference today, underlining the power of this new feature for Windows 10, and how it aims to truly streamline and make using the OS a far better organized experience. Those who test Windows 10 will already have played around with Sets, as it has been live in preview builds of the operating system for a little while now. The basic idea is to bring the concept of tabs from the web browser to the entire interface of the OS in general, so you can have windows with tabs that contain web pages, apps, folders – a mix of everything essentially. And at Build, Microsoft expanded on its final vision for Sets, which is that ‘content that belongs together should stay together’. In other words, you may have a document open, and when you click a link in that document, the web page opens in a tab alongside it – and maybe you open another web page – with everything staying organized in a Set. The real power is that when you return to work on that document, a prompt will remind you of the other tabs – whether they’re web pages, apps, or whatever – that were open alongside it, and offer to automatically fire them up again. That’s pretty nifty in terms of avoiding those horrible moments when you come back to a project knowing there was some web page which related to it, but you’re just can't remember it or find it in your browser bookmarks. Sets will also be integrated into Microsoft’s Timeline feature, and you’ll be able to pull them up across all your devices, from PC to phone. In short, Microsoft is working hard to make everything as seamless as possible. And in that same vein, another cool move is that web content is going to be woven in along with apps when you hit Alt + Tab. So rather than just seeing the programs you have open, you’ll be able to see everything you’ve recently done: every web page you’ve been hopping around (regardless of whether it’s actually currently open). And that should make it much easier to locate something you recently found on the web. Sadly, Microsoft didn’t give an indication of a timeframe for when Sets is expected to go live in Windows 10. Joe Belfiore, who was presenting at Build, only said that it would come to the operating system ‘when we think that it’s great’. It’ll be ready when it’s ready, in other words.